'If it was dead safe, I wouldn't do it. And I do get off on the pain,' the very colourful Guy Martin tells Rick Broadbent in That near-death thing. In stark contrast is John McGuinness who declares that it isn't the lack of safety that thrills him, in fact he'd like very much for things to be safe. Well, differing viewpoints don't change the fact that for the fearless riders who come to the island every June, it is quite simply impossible to escape its call. Yes, for two weeks a year, the small and rather quiet Isle of Man is transformed from its sleepy existence to a place that comes alive with the sound of engines screaming, the smell of burning rubber and the reverberation of motorcycles blatting past with throngs of people cheering them on. 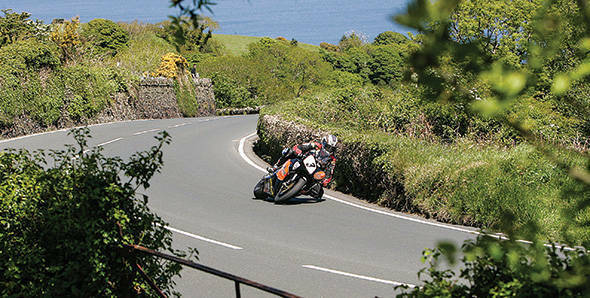 Welcome to the Isle of Man TT races - the greatest motorcycling spectacle on earth! Way back in 1906, a bunch of rather disgruntled motorcycle racers made their way back from the International Cup for Motorcycles in Austria. They were unhappy with the way the races had been run. Good thing too, because if they hadn't been quite so crabby about it, the legendary Isle of Man TT races might never have been conceived. The men in question - Charlie and Harry Collier of Matchless Motorcycles, the Marquis de Mouzilly St Mars and Freddie Straight, the then secretary of the Auto-Cycle Club. The four put their heads together and came up with the idea of having motorcycles race on closed public roads of the island. Touring motorcycles, no less, with classes for both single cylinder and twin cylinder motorcycles. And thus was born the Isle of Man Tourist Trophy. ... And over 100 years later, people still keep going back. So what is it about the TT, then? For starters, it's the course itself. The TT is run over a 37.73 mile (60.72 km) circuit, featuring 37 corners, that runs through the town of Douglas and up through the scary Snaefell mountains. And given that the roads that run through the town and the mountains are narrow, twisty and with no run off area whatsoever, a small mistake means a rider will pay very heavily. Crashing in the town means a rider will likely find himself wrapped around a lamp post. A crash in the mountains... well that's even worse. Since racing first commenced on the Snaefell course in 1911, the mountain has claimed 239 lives. Despite it all, generations of racers have said that there's nothing quite like the feeling of winning a race at the Isle of Man - it is dangerous, thrilling and exhilarating all at once, which is why they keep going back. And why they will continue to do so. Yes, the men who ride at the IOMTT have got nerves of steel. But it takes that, and perhaps a touch of sheer madness, to agree to be a passenger on the course. Putting your life in someone else's hands - the passengers do it every year! The Sidecar TT, has been running at the Isle of Man since 1923, and attracts nearly as much fanfare as the other classes. Since the event was first won by Freddie Dixon and Walter Perry, competitors like David Molyneux have won the Sidecar TT a record number of times. Then, there's Mad Sunday - probably one of the most manic happenings at a motorsport event. Every year during the Tourist Trophy races, the course is opened to the public on one Sunday. Anyone with a motorcycle, and sufficient amount of courage, can arrive at the course and ride alongside the pros. The perfect thing for wannabe Mike Hailwoods, then. And nearly as brave as the riders are the men and women who comprise the Orange Brigade, marshalling the event over the course of two weeks. What's interesting, though, is the fact that anyone over the age of 16, irrespective of previous experience, can become a marshal with the squad. It's probably the closest you can get to watching the races, and nearly as dangerous as being a rider. Decapitation is an occupational hazard. One of the most awaited events this year, however, is the Classic TT. Let's not forget, the Isle of Man TT is associated with legendary riders and machines, and what better way to celebrate this than combining the two. Featuring machines from the TT's glorious heyday, coupled with the current crop of riders, the Classic TT promises to be an event that will leave fans gobsmacked. Picture this - a bright-eyed young lad arrives at the hallowed island in 1982. He sees for the first time a man named Joey Dunlop race and something stirs within him. He has found the hero he needs to follow this sport closely. With the confidence and enthusiasm of youth, he goes up to Dunlop and declares that he shall share a podium with him someday. And then, years later, that's exactly what happens. Standing there on the podium for the 1997 Lightweight TT, it's Joey Dunlop on the top step, Ian Lougher on the second and an elated John McGuinness on the third step. It is only his second time at the Isle of Man and he has already finished in the top three. It is the beginning of the man we now call the Morecambe Missile. Flash forward to 2013, and McGuinness is set to take part in the TT once again, this time gunning for his 20th win at the event. He's no young 'un at the course anymore. He is the TT's living legend, a fact that is being recognised - his favourite part of the mountain course is being named after him, putting him on the same platform as the the likes of Giacomo Agostini, Geoff Duke, Mike Hailwood and even his idol Joey Dunlop. So, just how did a young lad, who once skipped his chemistry and English exams to watch the 600TT race become the legendary rider who is now a motorcycling hero for hundreds of young hopefuls? Well, because he's just that good. Since his first win at the Isle in 1999 - in the Lightweight 250TT class - McGuinness has won a minimum of one event at every edition of the TT he has contested (with the exception of 2010), taking his win tally to 19. But it's not just the number of wins he has that makes him a legend, more often than not, it's the way he's managed to get the wins. Over the years the win at the TT has been determined by lap times, although it's the average speed at which the racers travel that is discussed. When the 125 mph (200 kmph) barrier was broken, it was considered unthinkable. McGuinness was then the first man to ever lap the terrifying course at 128 mph (206 kmph), a feat he bettered when he clocked 129 mph (207.6 kmph). In an inspired first lap in 2009, the Morecambe Missile was on fire, breaking his own lap record and shattering the 130 mph (209 kmph) barrier. On the second lap, he shattered that too, averaging a speed of 131.578 mph (212 kmph) and lapping the circuit in 17min 12.30secs. Not for nothing is he clubbed with his hero, then. And it's precisely Dunlop's record of 26 TT wins that McGuinness has set his sights on this year. Like he says, if Dunlop could manage three TT wins at the age of 48, at 40 he himself has plenty of racing life in him yet. And we've got to say, we believe him!